Greetings, Capsuleers! This post will discuss the changes coming out for the Audio settings of EVE Online. In 2014, we released Kronos which provided players with in-depth sound customization options in the form of Advance Audio Settings. We introduced that change because we wanted our players to have more control when choosing what they personally prefer to hear in the game - especially when playing with many clients at the same time - and also because we wanted to encourage the experience of EVE Online's unique soundscape. The Advanced Audio Settings have been a partial success, functioning as intended but not having all the desired effects. We did indeed make the audio side of the game more flexible for our players, introducing some 30 different sliders for many possible audio mixing scenarios. Despite that customization, however, only a handful of players ultimately ended up using these customization options. 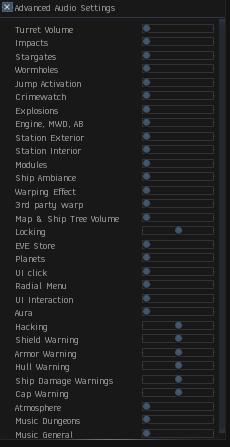 Client settings logging reveals that around 9% of total EVE players are using the Advance Audio Settings menu at all. Of them, only a third (3% of all EVE players) are using each individual slider. A large majority of the 9% are only using one or two sliders in the Audio Customization menu. Some are only using sliders for elements they've disabled via the normal Audio settings. Via survey, self-reporting, and focused testing, it became clear that complexity is the most likely reason for this lack of engagement with the menu options. New players confronted with the already gargantuan EVE Online options menu find the list of sliders daunting, and manual upkeep of the code yields more defects on the development side than the usage merits. Additionally, upkeep of the existing system when upgrading our middle-ware and adding new sounds to EVE is somewhat cumbersome. Frequently it is unclear where a sound should be included, or how to link new sound triggers into the existing system. We are dedicated to empowering EVE players, but in this instance simplification seemed better for both players and developers. With that in mind, in order to make the menu more inviting for everyone and clear up valuable interface space (not to mention developer hours) we have decided to simplify the Audio Customization menu greatly. This will require adjustment for many of the 9% that have been using the existing sliders, but we've taken steps to minimize that disruption by shifting and grouping the various sounds according to usage and type. The names of the regular Volume Level settings (the UI, Music, Speech, World and Master sliders) are not being changed but some of the old Advanced sliders are being diverted into those controls. For example, Aura's voice will now be controlled by the Speech Volume slider. * This indicates general wormhole atmosphere. The wormhole activation sound is controlled by the Jump Activation slider. We continue to investigate ways to improve this system, including modifying which features are controlled by which sliders and adjusting for popular requests, so do not hesitate to comment on the forums and make your own noise across New Eden. We look forward to streamlining the process of customization for all capsuleers and hopefully bumping that 9% up so that more players can experience all that EVE has to offer. If I'm reading this right, please separate stargates activation from station interiors. There is a gameplay advantage to hearing a stargate fire where as station buzzing is just super-tedious when we're docked for hours at a time. I would like to see the map volume broken out too. Having that constant whine when the map window is maddening, but I do like some of the UI sounds. That is only change a have problem with because sound of wormhole indicates its status unlike rest of atmosphere sounds. WHY do you hate wormholers so much? When i was living on POS i had to quiet down "Planets" because it occured that's the reason of annoying ambient sound - being really close to the planet on moon 1. From all sounds quoted above i only need "Wormhole" and "Jump Activation". And i really DON'T want to hear Stargates, f*ing Station noise nor planets and atmosphere. It's a space game, the less sounds the better. Especially when one account jumps with some worthless s**t through gates on autopilot and i couldn't care less if it jumps, dies or docks somewhere, and another does it's WH business (listening for jump, mass change or disappearance of WH) and least thing i want to hear is some f*****g Station Interior from another account. I'm a wormholer, I listen to the wormhole sound and that's my life. Slight misreading, but the result is positive: The wormhole activation sound (Jump Activation) is completely separate from Station Interiors (Atmosphere). Map is not lumped in with UI sounds, but is instead part of Secondary Interfaces. Win. Thanks for putting this up here. Please have a go at using the set up tomorrow and come back to see how the sliders worked out as far as minimizing the sounds you don't need, then add further comment. CCP Baldur will be monitoring the player response here. Please separate the wormhole ambience from the stargate hum. I live in wormholes on all of my accounts, and stargate ambiance plays no reliance impact on my game and gets turned down to near 0, Wormhole states however... Big deal. 3rd party warp should be its own items. It's not a jump effect there for it doesn't make sense. I keep that setting maxed at all times and turn down my jump effect to 3/4 volume. Station interior/exterior bound to the same slider as gate/wormhole effects isn't ideal either. I turn that down for sanity sake as the interior/ exterior station chatter don't really matter. From Testing I've done on SISI I can already tell you being bombarded by the station interior/exterior just for the sake of the wormhole states is going to be maddening. I would also like to see jump activation and wormhole activation in separate sliders also. I live in wormholes and have the wormhole activation turned pretty much right up. If I have to turn down the gates (because jesus they get loud) every time I go into K-Space it gets tedious. I also have 3rd party warp set up high also. This is effective because you can tell when something else is landing on grid that you cannot necessarily see. Say for example, if its a fleet mate or someone is landing on a grid where your overview is cramped. Sight specifics on this point. Right now they all seem to be lumped into the UI interaction sliders based on what I'm reading. This would allow "power users" to get their settings just right, while taking the pressure off the UI team. UI Click -> (UI Sound Level) <--- really should be bound to its own item still. cause dammit it's annoying. I object to this streamlining. There should be more controls for audio, not fewer. The ability to manage the volume level of in-game sounds is important to my enjoyment of the game. There are some sounds in the game that are highly annoying - the DScan BOOM for example. I use dscan a lot so that sound annoys me a lot. Presently I find it not at all helpful that the only way to soften that awful sound is to turn the UI setting way down, but that makes other UI sounds hard to hear. Recent updates added a number of new sounds and I'd like an ability to soften or accentuate several of them. It will make the playing experience more enjoyable if I can hear the sounds I want to hear that provide important in-game feedback, without getting annoyed by the ones that are intrusive and irritating and don't provide any significant feedback to in-game activities. I'll do absolutely anything to separate the dscan ping from everything else. Seriously I'll come to Iceland and do your laundry for a year. Anyone that flies small gang/solo or lives in wormholes needs to dscan every few seconds. I don't want to roleplay a submarine commander. Muting UI interaction already means I don't get killmail dongs and now it's gonna be more on top of that. If you don't want to spend dev hours is there at least a line I can add to the prefs.ini or something? I'll do absolutely anything to separate the dscan ping from everything else. Seriously I'll come to Iceland and do your laundry for a year. I don't think you understand what you're volunteering for. That is laundry made from diets consisting of Hakarl (fermented shark) washed down with Brennivin (Black Death). Just wanted to stop in and say thanks for providing the mappings. Also, glad to see "3rd Party Warp" is under Jump Activation, since I'd want options for situational audio to be turned on. As a wormholer, contrary to some other people, I don't mind not having the ambient audio of the wormholes turned on. I just need the jump activation sounds, and that's already covered with Jump Activation. Now that you've opted to de-granularize the sfx, the user is now left to wonder which sounds fall into which category, and if they wish to attenuate or emphasize a specific sound, a bunch of other sounds will go along for the ride, perhaps undesirably. Has it occurred to you that you're putting too much stock into blind metrics which ignore context? Maybe most people are fine with volumes, generally speaking? Perhaps it's the UI and people might be put off with a WALL OF SLIDERS, but to those who want to be surgical in how the client emits audio, these are a boon. Please do not remove this. A better solution would be to replace those panes in the options menu with the simplified sliders, but have an "Advanced Audio Prefs" button which takes you to a sub-menu thatcontains the granular settings. You get the best of both worlds and those who don't wish to hear station gibberish sfx all day won't have to sacrifice hearing more desirable sounds just so they don't get driven crazy. will the Inactive Client Muting receive a similar simplification? (somewhat unrelated) from the Inactive Client Muting which is the appropriate checkbox for 3rd party warp and gate/hole activation? Think for yourself. Don't be sheep! I use the sliders, i like the sliders. Everytime i see a lot of options in a game it gets +10 for individual customizability. Don't downgrade from something great please! Don't become one of those games that wants to be from ages 9-90! I solved it! Have both! Show the new options on default and have a little checkbox with "show advanced settings" or something like that on the bottom. Under these settings I will now have to not hear hacking so that I don't have to listen to the submarine sounds when I hit d-scan every 2 seconds. It also means I won't be able to hear aggression or locking if I don't want to have to listen to thousands of annoying tiny clicks as I mouse over things. Fantastic. Why don't we just start "simplifying" the interface too; Just jam every window into the overview on tabs. I guess I'm part of the percentage of players that doesn't make a difference, but I wanted my displeasure on record. Who the hell did you survey? Empire carebears? This change is a bad one. DO NOT TAKE MY OPTIONS AWAY! Gonna miss having only wormhole jump sounds up while stargate is down. I don't need to hear loud gates when I'm just going to the market. Now if we want to hear the locking sounds... including when its finished (a sound that's famous, heck you use it on the intro sequence of the o7 Show)... we have to subject ourselves to the annoying xylophone of the mouseover UI Click as our cursor moves over the UI. Welp, guess we'll have to do without now.